A young girl named Mija risks everything to prevent a powerful, multi-national company from kidnapping her best friend - a massive animal named Okja. Okja is directed by Joon-ho Bong and was released on Jun 28th, 2017. 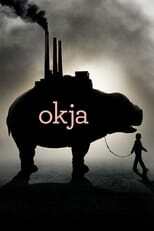 Director Joon-ho Bong's Adventure & Drama movie Okja is produced by Kate Street Picture Company & Plan B Entertainment & was released 2017-06-28.